This tutorial explains how to configure EIGRP Routing protocol in Cisco Routers step by step with practical example in packet tracer. Learn EIGRP configuration commands, EIGRP show commands, EIGRP network configuration (with & without wildcards) and EIGRP routing (classful & classless) in detail. For demonstration purpose I will use packet tracer network simulator software. You can use any network simulator software or can use a real Cisco devices to follow this guide. There is no difference in output as long as your selected software contains the commands explained in this tutorial. This tutorial is last part of our article “EIGRP Routing Protocol Explained with examples". You can read other parts of this article here. This is the first part of this article. In this part we explained basic concepts of EIGRP such as Features and characteristics of EIGRP, Neighbor Table, Topology Table, Routing Table, Protocol Dependent Modules, Metric, RTP, DUAL, Autonomous System and Administrative Distance. This is the second part of this article. In this part we explained how two routers become EIGRP neighbor and maintain this neighborship. In order to become an EIGRP neighbor, three essential configuration values must be matched. This part explains these values with neighborship building process in detail with example. This is the third part of this article. EIGRP uses composite metric calculation formula to calculate the best path. Bandwidth, reliability, delay, load and MTU are the components of formula. In this part we explained these components with formula in easy language with examples. Double click PC0 and click Desktop menu item and click IP Configuration. Assign IP address 10.0.0.2/8 to PC0. Repeat same process for Server0 and assign IP address 20.0.0.2/8. Double click Router0 and click CLI and press Enter key to access the command prompt of Router0. Three interfaces FastEthernet0/0, FastEthernet0/1 and Serial0/0/0 of Router0 are used in this topology. By default interfaces on router are remain administratively down during the start up. We need to configure IP address and other parameters on interfaces before we could actually use them for routing. Interface mode is used to assign the IP address and other parameters. Interface mode can be accessed from global configuration mode. Following commands are used to access the global configuration mode. From global configuration mode we can enter in interface mode. From there we can configure the interface. Following commands will assign IP address on FastEthernet0/0 and FastEthernet0/1. interface fastEthernet 0/0 command is used to enter in interface mode. ip address 10.0.0.1 255.0.0.0 command will assign IP address to interface. no shutdown command will bring the interface up. exit command is used to return in global configuration mode. Serial interface needs two additional parameters clock rate and bandwidth. Every serial cable has two ends DTE and DCE. These parameters are always configured at DCE end. We can use show controllers interface command from privilege mode to check the cable’s end. Fourth line of output confirms that DCE end of serial cable is attached. If you see DTE here instead of DCE skip these parameters. Now we have necessary information let’s assign IP address to serial interface. Router#configure terminal Command is used to enter in global configuration mode. Router(config)#interface serial 0/0/0 Command is used to enter in interface mode. Router(config-if)#ip address 192.168.1.245 255.255.255.252 Command assigns IP address to interface. For serial link we usually use IP address from /30 subnet. In real life environment this parameter controls the data flow between serial links and need to be set at service provider’s end. In lab environment we need not to worry about this value. We can use any valid rate here. Bandwidth works as an influencer. It is used to influence the metric calculation of EIGRP or any other routing protocol which uses bandwidth parameter in route selection process. Router(config-if)#no shutdown Command brings interface up. Router(config-if)#exit Command is used to return in global configuration mode. We will use same commands to assign IP addresses on interfaces of remaining routers. We need to provided clock rate and bandwidth only on DCE side of serial interface. Following command will assign IP addresses on interface of Router1. We will use same commands to assign IP addresses on interfaces of remaining routers. Great job we have finished our half journey. Now routers have information about the networks that they have on their own interfaces. Routers will not exchange this information between them on their own. We need to implement EIGRP routing protocol that will insist them to share this information. If you are do not want to go through the above IP configuration processes, download this pre-configured topology. Enable EIGRP routing protocol from global configuration mode. Tell EIGRP which interfaces we want to include. For these steps following commands are used respectively. This command will enable EIGRP routing protocol in router. We can use any ASN (Autonomous System Number) from 1 to 65,535. In order to become EIGRP neighbors this number must be same on all participates. This command allows us to specify the local interfaces which we want to include in EIGRP. Basically we define a range of addresses and router search for these addresses in local interfaces. If match found EIGRP will be enabled on that interface. Once enabled, EIGRP will starts advertising about the connected subnets with that interface. Choosing this option allows us to configure the classful network. This option is very straightforward. All we need to do is, type the network ID with network command. For example network 172.168.0.0 command will enable EIGRP on all interfaces which belong to network 172.168.0.0. What if I type network number instead of network ID? Well in this situation EIGRP will automatically convert it back to network ID in which this network number is resides. For example 172.168.1.1 will be converted back in 172.168.0.0. Why it will be converted in 172.168.0.0 instead of 172.168.1.0? We have four networks 172.168.1.0/24, 172.168.2.0/24, 172.168.3.0/24 and 172.168.4.0/24 Subnetted from single class B network 172.168.0.0/16. Classful configuration does not understand the concept of Subnetting. In classful configuration all these networks belong to a single network. Classful configuration works only with in default boundary of mask. Default boundary of this address is 16 bits. So it will match only first 16 bits (172.168.x.y) of network address. If we want excludes serial interfaces from EIGRP, we need to configure network command with more specific information. In this option we provide wildcard mask along with network ID. Wildcard mask allows us to match exact networks. With wildcard we are no longer limited with default boundaries. We can match Subnetted networks as well as default networks. For example we were tasked to exclude serial interfaces in above configuration. We can use a wildcard mask of 0.0.0.255 to match the subnet mask of /24. Above commands will ask router to match /24 bits of address instead of default /16 bits. Now router will look for 172.168.1.x and 172.168.2.x network. Our serial interfaces have 172.168.3.0/24 and 172.168.4.0/24 networks which do not fall in these search criteria. If you are unfamiliar with wildcard mask, I suggest you to read our tutorials on ACL where we explained wildcard mask in detail with examples. Until you learn wildcard mask, use subnet mask in the place of wildcard mask. Following commands are also valid and do the same job by matching /24 bits of address. Subnet mask is a substitute, not a replacement of wildcard mask. When we use Subnet mask, router converts them in wildcard mask before searching for associated interfaces. We can look in running configuration to know what exactly being used by router. If you are a CCNA candidate or preparing for any Cisco certification, I suggest you to use wildcard mask instead of Subnet mask with network command. In real life implementation you can use either subnet mask or wildcard mask. If you use wildcard, it will be used as it is. If you use subnet mask, it will be converted in wildcard mask before using. Now we know the essential commands for configuration. Let’s implement them in our network. As I mentioned earlier, we can use both wildcard mask and subnet mask with network command. We have used wildcard mask for above routers. In remaining routers we will use subnet mask. That’s it. Our network is ready to take the advantage of EIGRP routing. To verify the setup we will use ping command. ping command is used to test the connectivity between two devices. We have two routes between source and destination. tracert command is used to know the route which is used to get the destination. Access the command prompt of PC1 and use ping command to test the connectivity from Server0. After that use tracert command to print the taken path. Good going we have successfully implemented EIGRP routing protocol in our network. If you are not getting same output download this configured topology and cross check with your topology to figure out the reason. EIGRP protocol automatically manages all routes for us. If one route goes down, it will automatically switch to another available route. To explain this process more clearly we have added one additional route in our network. Currently there are two routes between PC0 and Server. By default EIGRP uses the route that has low metric value. Our path separates from Router0, so let’s see which route it takes to deliver the packet of 20.0.0.0 network. 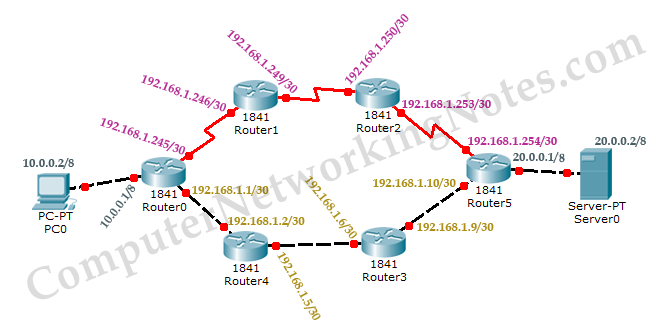 show ip route eigrp command will list all available routes. D: - It indicates that route is learned by EIGRP. Cisco chose letter D for EIGRP, because letter E was already taken by Exterior Gateway Protocol (EGP). 20.0.0.0/8: - It is our destination network. 90: - Administrative distance of EIGRP. Via 192.168.1.2: - IP address of the next hop. FastEthernet1: - Exit interface of this router to get the next hop. You may wonder where Route2 is in this output. Well EIGRP puts only the best route in routing table. Route2’s metric value is higher than Route1. Till route1 is available, it will not insert route2 in routing table. When route1 is down, it will look for next possible route. If other routes are available, it will replace current route with new route which has the lowest metric value. We can watch this process live with debug eigrp fsm command. On debug process on Router0. Now suppose route1 is down. We can simulate this situation by removing the cable attached between Router3 [Fa0/1] and Router5 [Fa0/1]. Okay our primary route went down. What will be happen now? EIGRP will look in topology table for next available routes. If single alternative is available, it will be selected. If multiple routes are available, it will select the route with the lowest metric value. We can use show ip route eigrp command again to see the selected route. Run tracert command again from PC0 to verify the change. That’s all for this article. Before closing just do a quick recap of important commands. Router(config)#router eigrp 20 Enable EIGRP with AS number 20. AS number must be same on all routers to become EIGRP neighbor. Router(config-router)#network 10.10.0.0 Enable EIGRP on interfaces which belongs to network 10.0.0.0/8. [Classful implementation]. Router(config-router)#network 10.10.0.0 0.0.255.255 Enable EIGRP on interfaces which belongs to network 10.10.0.0/16. [Classless implementation – Wildcard mask method]. Router(config-router)#network 10.10.0.0 255.255.0.0 Enable EIGRP on interfaces which belongs to network 10.10.0.0/16. [Classless implementation – Subnet mask method]. Router(config-router)#no network 10.10.0.0 Disable EIGRP on interfaces which belongs to network 10.0.0.0/8. Router(config-router)#no network 10.10.0.0 0.0.255.255 Disable EIGRP on interfaces which belongs to network 10.10.0.0/16. Router(config-router)#no network 10.10.0.0 255.255.0.0 Disable EIGRP on interfaces which belongs to network 10.10.0.0/16. Router(config-router) #metric weights tos k1 k2 k3 k4 k5 Enable/Disable K values used in metric calculation formula. Tos(type of service), K1(bandwidth), K2(load), K3(delay), K4(reliability), K5(MTU). By default only K1 and K3 are enabled. Router(config-router)#no auto-summary Disable auto summarization feature of EIGRP. Router(config)#no router eigrp 20 Disable EIGRP routing process 20. Router(config-if)#bandwidth 64 Set bandwidth to 64Kbps. Used to influence the metric calculation. Router#show ip eigrp neighbors Display the neighbor table in brief. Router#show ip eigrp neighbors detail Display the neighbor table in detail. Used to verify whether a neighbor is configured as stub router or not. Router#show ip eigrp interfaces Display information about all EIGRP interfaces. Router#show ip eigrp interfaces serial 0/0 Display information about a particular EIGRP interface. Router#show ip eigrp interfaces 20 Display information about EIGRP interfaces running AS process 20. Router#show ip eigrp topology Displays the topology table. Router#show ip eigrp traffic Displays the number and type of packets sent and received. Router#show ip route eigrp Display EIGRP route from routing table. Router#debug eigrp fsm Displays the events or actions related to feasible successor metrics (FSM). Router#debug eigrp packet Displays the events or actions related to EIGRP packets. Router#no debug eigrp fsm Turn off debug message related to feasible successor metrics (FSM). Router#no debug eigrp packet Turn off debug message related to EIGRP packets.